Garcia Oliver, Juan. 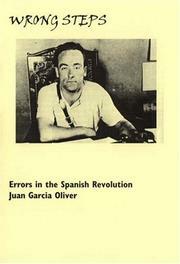 Wrong Steps : Errors in the Spanish revolution . Kate Sharpley Library: 2000. 26 pages. Translated by Mick Parkin and Paul Sharkey. Garcia Oliver, a leading anarchist militant, gives his (controversial) assessment of what went wrong during the long-awaited Spanish revolution. Includes a number of responses to his account. 9781873605721 £1.50 Only available in the U.K. Find at a local library. Garcia Oliver, Juan. My Revolutionary Life : Juan Garcia Oliver interviewed by Freddy Gomez . Garcia Garcia, Miguel and Albert Meltzer. Miguel Garcia's Story . Christie, Stuart, Albert Meltzer and Philip Ruff. I Couldn't Paint Golden Angels: Sixty Years of Commonplace Life and Anarchist Agitation .